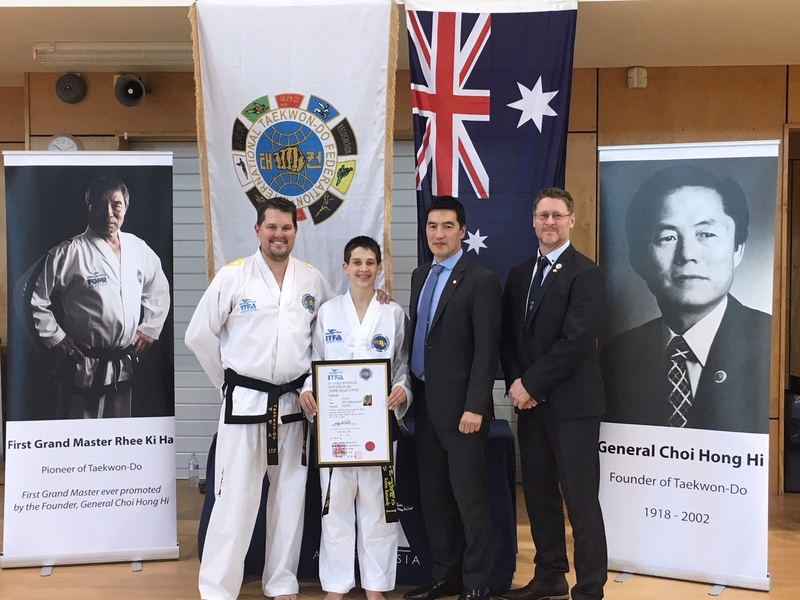 Taekwon-Do is, arguably, the most dynamic and academic martial art in the world, with a genuine ranking system, code of ethics, conduct, cultural discipline and promotion of health, well-being and personal safety, it is also the most popular of all martial arts. Patterns (Tul): A pattern is a series of fundamental movements set together in a logical sequence of defence and attack against one or more imaginary opponents. The pattern is most commonly used to allow the student to be assessed at his/her grading examination. There are a total of 24 patterns from the beginner to 6th Dan black belt. One pattern must be mastered for each grading up to 1st Dan black belt, then 3 patterns for each black belt examination. Each pattern has a link with history and culture of the Korean people, through its name and diagram it scribes on the floor during its performance. Sparring (Matsogi): During sparring the imaginary opponent is replaced with a real opponent so that the student can actually defend themselves against a live attack and counter to an exact target presented by an opponent. To start with, the student learns the procedure of very strictly controlled sparring in the form of 3-step, 2-step and 1step sparring. These form the basis for an effective self-defence against a moving target with few parameters guiding where and how to attack. 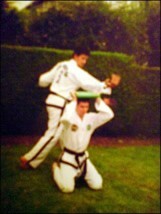 It tends to be very fast and teaches the student how to move in a defence and attack situation. It also promotes tenacity and courage. 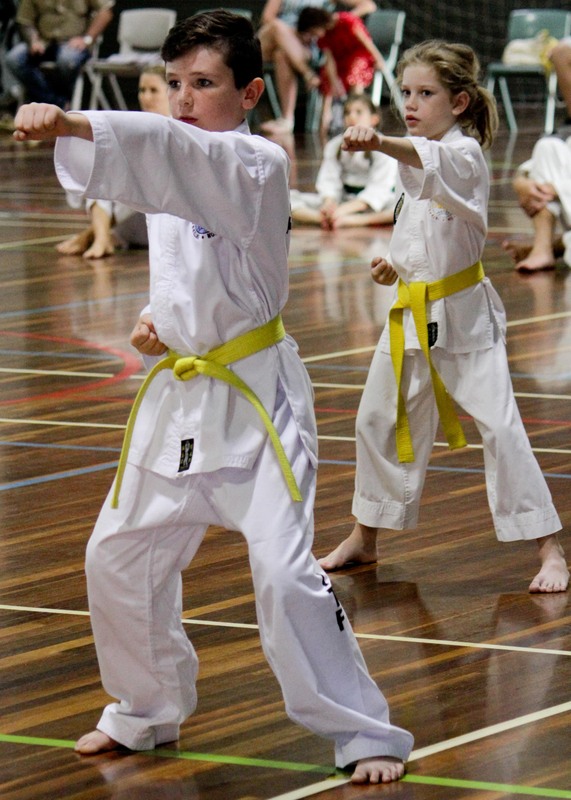 Power Test (Wee Ryok: Taekwon-do is the most powerful of the Martial arts and therefore must be controlled. Thus no contact is allowed unless senior grades wish to participate in light contact with consent from the Instructor. Therefore the students need an alternative target. 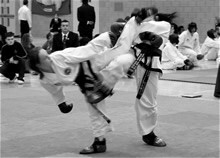 Taekwon-do provides a choice of targets to replace the human opponent. The student can strike raw materials such as wood, tiles, brick’s or more commonly, the specially developed plastic focus board. This allows the student to test and perfect full power techniques against measured resistance. The practice of ‘Breaking’ gives confidence to the student in that his/her techniques work and provide an examinable test. Taekwon-do cannot simply be copied. It has to be studied. As described in the definition in the first paragraph Taekwon-do is a science. In the theory section, the student learns a code of conduct, or tenets that should become part of his/her life. The tenets are as follows: – Courtesy, Integrity, Perseverance, Self-control and Indomitable Spirit. The student will also learn about the history of Taekwon-do and its controlling bodies. Taekwon-do as a science has been written down explaining all the techniques and theories behind methods of movement. This isn’t just a book – it is a fifteen-volume encyclopaedia containing more than 2600 movements. These are very advanced techniques utilising multi-target attacks mainly for demonstration purposes. 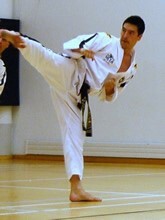 These techniques clearly show the superiority of the Taekwon-do student over and above all other Martial Arts.